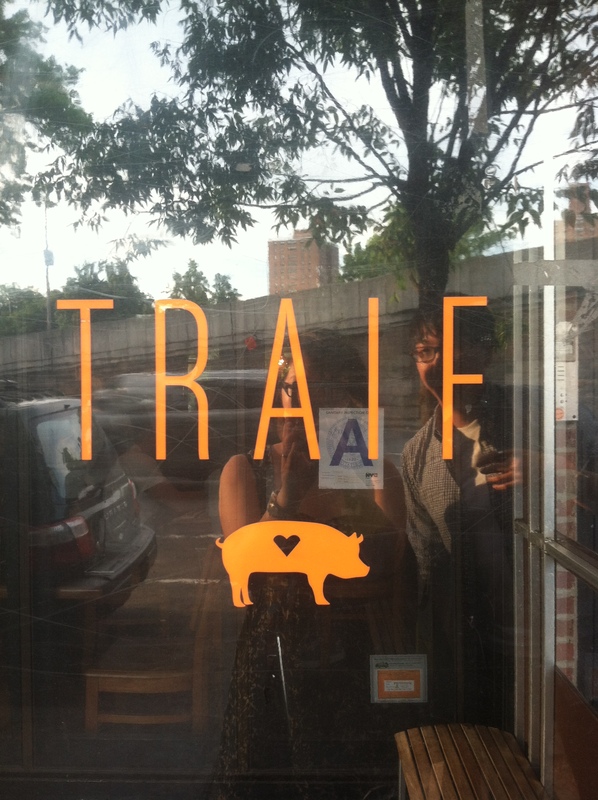 There has been a lot of hype surrounding Traif, located in the South Side of Williamsburg. Traif is definitely not located in the hip side of Williamsburg – if anything, the neighborhood made me think of where I grew up in Sunset Park. But don’t let that deter you from paying them a visit. They have a 27 rating for food on Zagat and although I don’t always trust Zagat, this is one time where we should. Traif’s rating is right smack in between 1 Michelin-stared Nomad and 2 Michelin-stared Marea. Just keep that in mind as I wax poetic about one of the most delicious meals I have ever eaten in my life. We arrived at 6pm on the dot, which is when they open. We were just wandering around the neighborhood because we were early. When we popped in through the door, the male host actually had to ask the female hostess if they had any walk-in tables left. Good thing we came at 6pm on the dot because we managed to snag their only walk-in table available. Lesson learned: always make a reservation because this place is super busy. We were seated in the back of the restaurant and right across from the kitchen. They don’t have an actual kitchen – it’s more of a tiny area behind the bar with a stove and an oven. I have no idea how they create such delicious dishes in such tiny a space but I’m not complaining. Our waitress came over almost immediately and explained to us first-timers that Traif is family-style dining in which every dish is shared by the table and there are no traditional appetizers or entrees. We placed our order and our very first dish came relatively quickly. We started from the top and worked our way down the bottom of the menu since it goes from light to heavy. 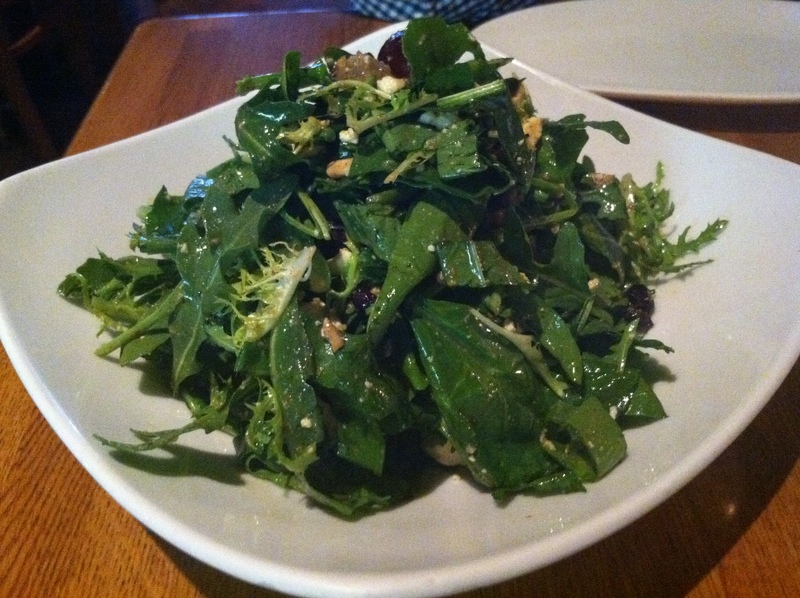 Our first dish was the Arugula Salad with snap peas, red grapes, currants, feta cheese and a spiced vinaigrette ($7.00). The salad was very refreshing and was a great way to start our meal. The red grapes were surprisingly very sweet and the vinaigrette was very light. The balance of sweet and sour really opened up our appetites for the rest of the meal. 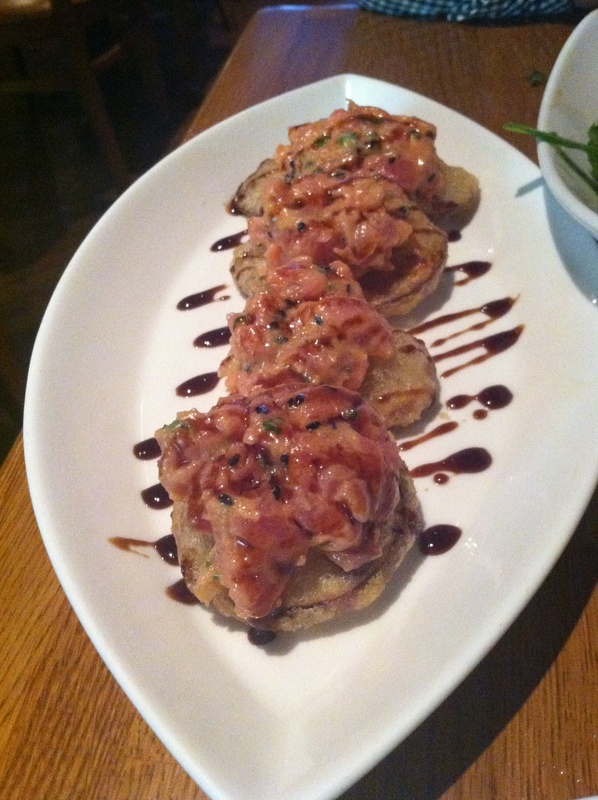 Our next dish was the Spicy Big-eyed Tuna Tartare, served on top of Japanese eggplant tempura ($9.00). We had underestimated how good this dish would be. The tuna was extremely fresh and flavorful. But paired with eggplant tempura, something both of us had never even thought of before, it was even better. The combination of the spice and saltiness was a taste explosion in our mouths. The creamy tuna combined with the crunchiness of the eggplant for a very complex texture. This is definitely one to satisfy all the Japanese-food lovers out there. 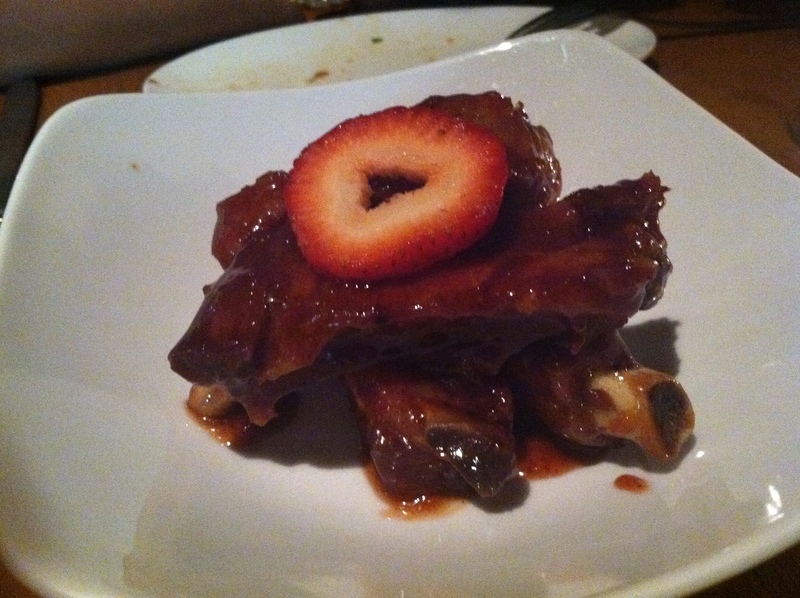 Our third dish was their Strawberry-Cinnamon Glazed Baby Back Ribs ($10.00). Both the Boyfriend and I are not usually a big fan of ribs. They’re sticky, messy and often get stuck in your teeth whenever you tear into them. But these were completely different and I wouldn’t mind eating ribs everyday if they all tasted like these. First, the ribs are extremely tender. They all fell right off the bone with a light tug with my fork. There was no sticky mess when we ate these. Second, the flavor! I never knew strawberry could taste so good on ribs. These were so sweet and so succulent. Our fourth dish might be my favorite. I use the word “might” because everything tasted so good that I can’t really pick a clear winner. 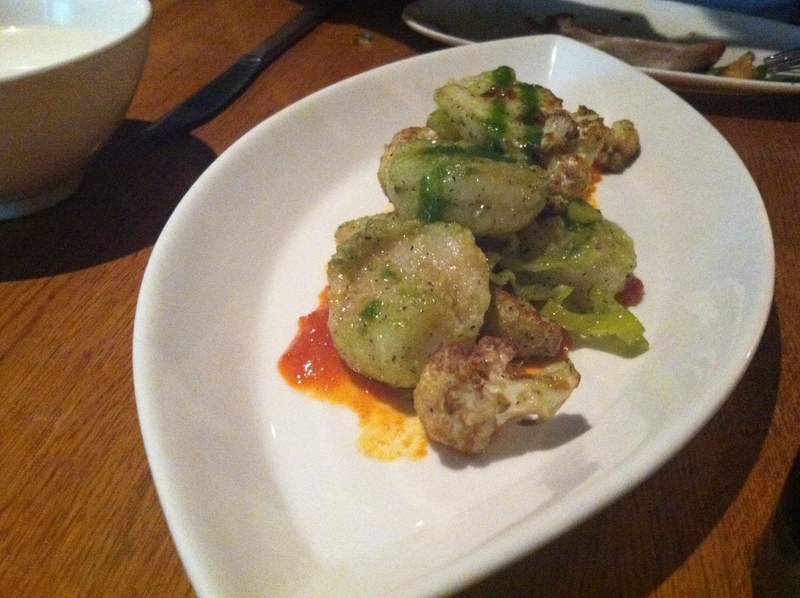 We opted, on a whim, to try the Salt & Pepper Shrimp with Cauliflower ($10.00). The flavors and the texture really blew me away. The shrimp is lightly battered and and fried, which allowed it’s natural juices to stay in the shrimp. This is definitely not your typical fried shrimp. The combination of salt and pepper was really balanced. You’re all probably wondering why I love this dish since it sounds so simple. But it wasn’t simple at all. There was a buttery and creamy taste to the shrimp but for all we knew, it wasn’t oily or greasy like butter. I just couldn’t explain what I was eating! The Salt & Pepper Shrimp isn’t mentioned much on Yelp, but I highly recommend it. 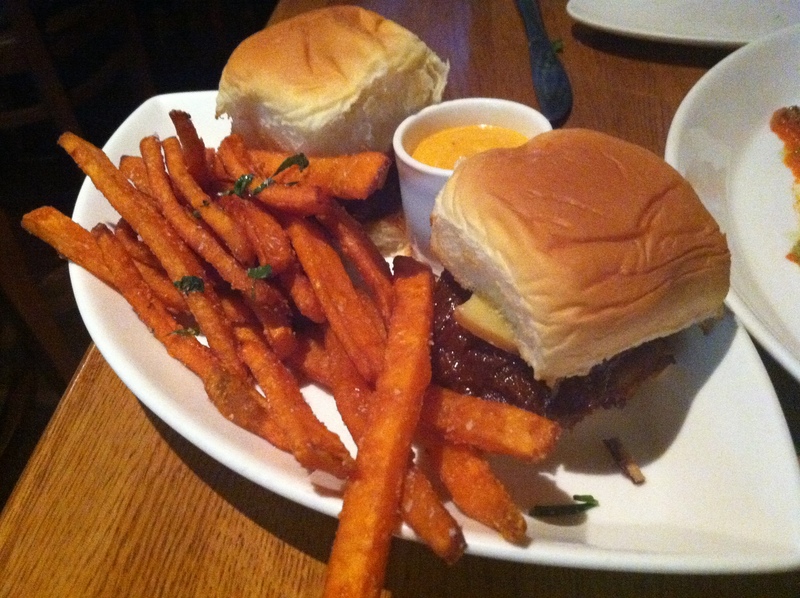 Our final savory dish is BBQ Braised Short Rib Sliders, served with sweet potato fries and smoked paprika aioli ($9.00). The short rib was extremely soft and tender. Each bite practically melted in our mouths and we barely had to chew! The sweet potato fries were very crunchy and cut very thinly. I liked this method because I actually felt like I was eating fries and not a mound of sweet potato. The smoked paprika aioli was amazing! I’m not always a fan of aioli as a fries dipping sauce but this one really blew us away. After we finished our meal, our waitress came by to clear our table and offer their dessert menu. We knew what dessert we wanted already but a glance at the menu made us order a second dessert. 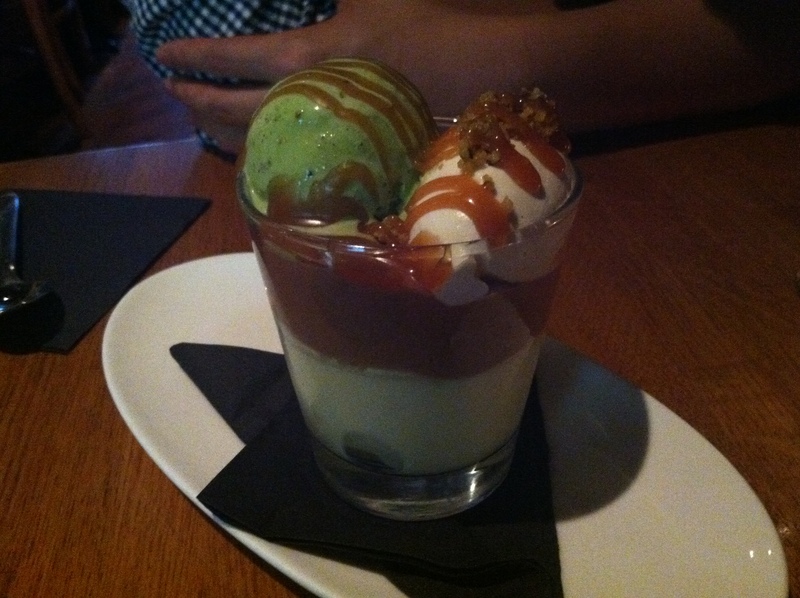 The first to arrive was the White Chocolate Budino with pistachio ice cream and whipped cream ($7.00). Budino is a dessert that’s similar to pudding or custard. But let me tell you, the budino we had was fluffier than any pudding or custard we have ever had. The whole cup was so soft and pillowy. The Boyfriend isn’t really a fan of dessert – he’ll have one or two bites but then he leaves it all to me to finish. Not this time though! We demolished this dessert so fast because it was just so good. It wasn’t overly sweet and it was just so fluffy! 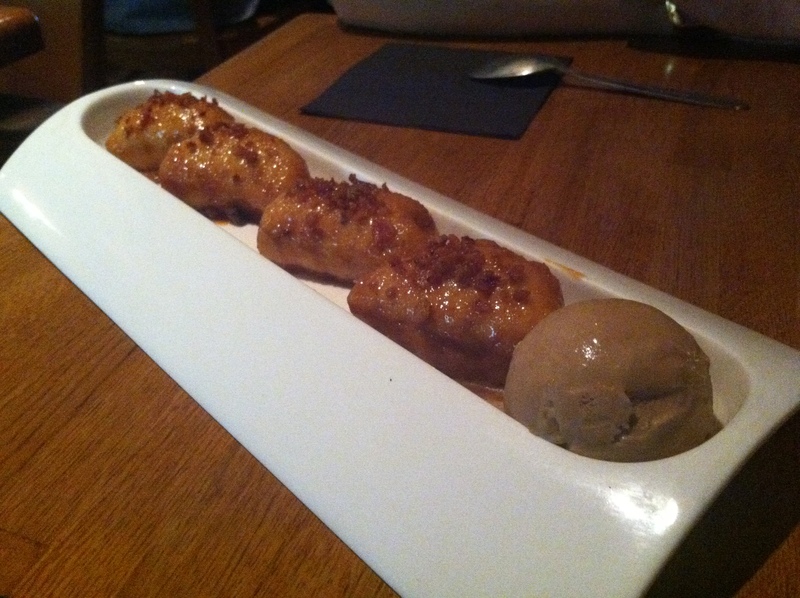 And alas, we reach the famous Bacon Doughnuts served with coffee ice cream ($7.00). There aren’t really words to describe these doughnuts – it was that heavenly. The doughnuts were softer than any doughnut I have ever eaten. You can cut through them with a spoon in one go. They were warm and sweet but with a slight crunch from the bacon bits on top of them. The warm sweetness of the doughnuts just meshed so well with the cold bitterness of the coffee ice cream. I applaud the chef for thinking of such an odd combination. After we finished, we wished there was more. I think that if you give this to any anti-dessert person, even they will gobble it up in seconds! The great thing about Traif is that you get some complimentary items before your meal and after your meal. Before our meal, we received a tiny cup of Strawberry Gazpacho to open up our appetites. It was delicious! The sweet and sour mixture really helped open up our appetites and stomaches for the incoming feast. 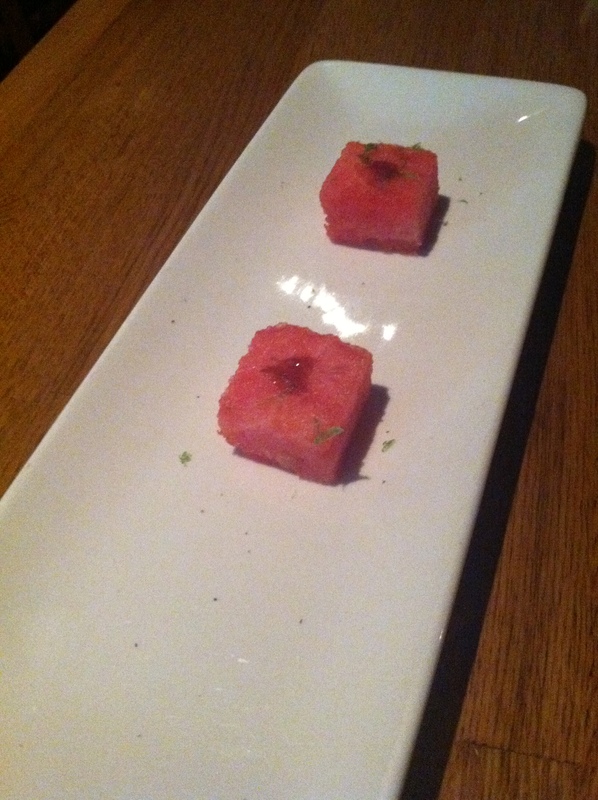 After our meal, we received two tiny pieces of fresh watermelon with sweet molasses and lime juice. Such a nice and refreshing way to end our meal! The service was also very quick and attentive. If it wasn’t our original waitress, it was other waiters and busboys checking up in our table to take away dishes and change dishes. The beer selection, while a bit on the expensive size, proved to be very strong. Most beers are about 4.5% abv but these were up to 11.5% abv! There are legit no complaints about my meal at Traif – not even one! Everything was delicious from start to finish. I don’t think I have ever appreciated the combinations of very different flavors up until my meal here. If I could rate Traif out of 5 stars, I would give them 10! Absolutely amazing!